The Short Version: Mesa, Arizona attracts visitors who want to get away from it all and connect in a scenic destination out West. The city gives people the best of both worlds by offering modern urban spots as well as relaxing rural areas. If you’re planning a date in Mesa, you don’t have to look very far to find a good time. 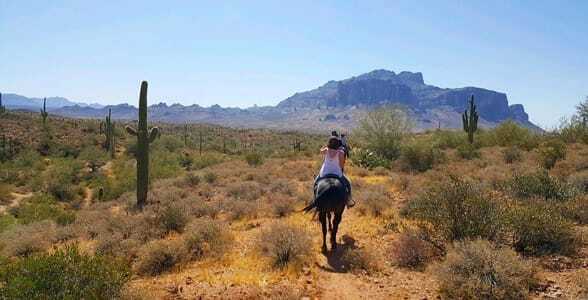 The Arizona desert is an outdoor playground for couples who enjoy hiking, biking, and horseback riding together. You can explore hidden canyons, peaceful rivers, and miles of backcountry trails in the untamed wilderness that surrounds Mesa’s downtown area. At the end of the day, you can cool off with a margarita or a glass of wine and share a refreshing farm-to-table meal with your loved one. Whether you take a date out on the town or into the countryside, you’re sure to have a memorable experience in Mesa. Mesa is the third largest city in Arizona and the 38th largest city in the US. According to the 2010 census, its population totals just over 439,000 people, and around 29% of residents are between 25 and 44 years old. This demographic brings a youthful and active spirit to the city, which is full of activities for daters seeking excitement. The arid climate doesn’t stop outdoorsy folks from having a good time in and around Mesa. Many people soak in the sunshine while spending a day enjoying the mountain trails, public parks, or refreshing lakes. 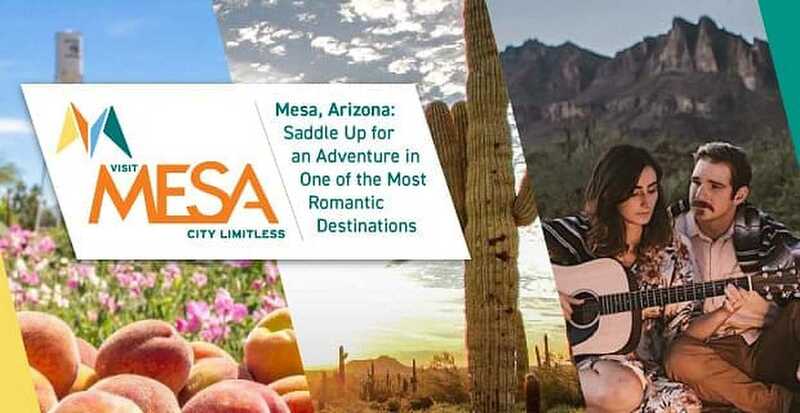 Because of its wide-open plains and mountainous wilderness, Mesa is known as the City Limitless, and couples have endless opportunities to connect in its urban and rural areas. The city’s active nightlife and rugged geography satisfy people with a variety of interests. You can take a date to a local brewery to share a drink in a laid-back setting, or you can set out on a scenic tour of the natural valleys, deserts, forests, and waterways in the region. Mesa’s restaurants showcase Southwestern cuisine as well as international fare, so visitors get the best of both worlds. Whether you’re craving old-fashioned comfort food or something more exotic, you can find many satisfying treats throughout the city. You’ll often see couples sharing drinks at a table for two at Rosa’s Mexican Restaurant and Taqueria. People come for the authentic Mexican cuisine, and they stay for the colorful, welcoming atmosphere. The restaurant is modeled after a Mexican villa with three outdoor patios to allow diners to enjoy the mountain air. You can sip margaritas or piña coladas at the Cantina grab a quick bite at the Taqueria, a take-out joint (complete with salsa bar) next to the restaurant. 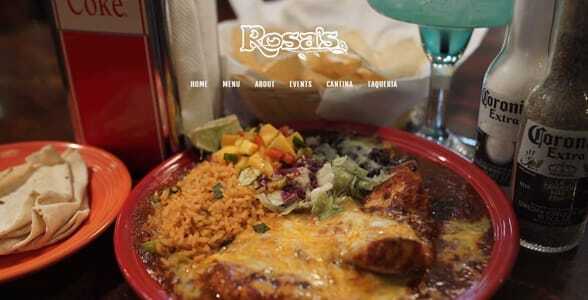 Rosa’s Mexican Restaurant & Taqueria serves up rich Baja Mexican dishes. The Organ Pizza Stop is a uniquely delicious and entertaining destination where couples can grab a bite to eat and listen to world-class musicians. The theater’s over 6,000 pipes and percussion instruments blow visitors away with an all-encompassing musical experience. You can indulge in a specialty pizza or pile your plate with veggies at the salad bar while listening to an organist play “The Phantom of the Opera” or the “Star Wars” theme song. The Fresh Foodie Trail features some of Arizona’s finest culinary establishments and local farms, including the Orange Patch, the Superstition (Dairy) Farm, Agritopia, and the Pork Shop. You can sample Mesa’s bountiful harvest and learn about its agricultural industry in a unique food-driven experience. Taking a date along the Fresh Foodie Trail guarantees you’ll have plenty of fresh things to talk about and fresh food to eat. Although Mesa is in an arid location, it’s hardly deserted of outdoor fun. With over 3,000 species of plants and animals, the city boasts one of the most diverse ecosystems in the US. Couples can spend all day exploring the different plants and animals that live here. Whether you enjoy hiking, biking, or horseback riding, you and your date can blaze a trail through the wilderness together and share an exciting experience in the fresh air. Michelle said the Usery Mountain Regional Park is one of Mesa’s most popular outdoor destinations because of its 29 miles of mountain trails and scenic viewpoints of the surrounding plains. You can search through Visit Mesa’s online directory of outdoor activities to find the right date activity for you. You can bond with your date by exploring the great outdoors of Mesa, Arizona. Arizona Desert Mountain Jeep Tours offers couples a chance to take in the sights from a four-wheel open-air jeep. The cowboy guides take visitors through the rugged terrain for three hours and point out the unique flora and fauna. It’s the adventure of a lifetime. Plus, you can always up the romance by going on a sunset tour where you can watch the setting sun fill the sky with color. If you’re looking to relax as you take in Mesa’s beautiful mountain scenery, you may want to consider a 90-minute steamboat tour or hot air balloon to sweep your dates off their feet. Hot Air Expeditions promises a peaceful flight that’s ideal for first-time flyers. For 27+ years, the company has been offering memorable experiences to locals and tourists in Arizona. Sightseers in Mesa have a lot of options to entertain themselves all year round. For instance, Mesa is home to the largest organic peach grower in the state. Schnepf Farms is a 300-acre fourth-generation family farm known for its welcoming atmosphere and fresh bounty. A few times a year, the farm hosts Dinners Down the Orchard to feature its seasonal treats paired with wine. You can book a seat at the table and savor an unforgettable meal under the stars. Every February, Schnepf Farms opens its doors to hundreds of folks during the Peach Blossom Celebration. 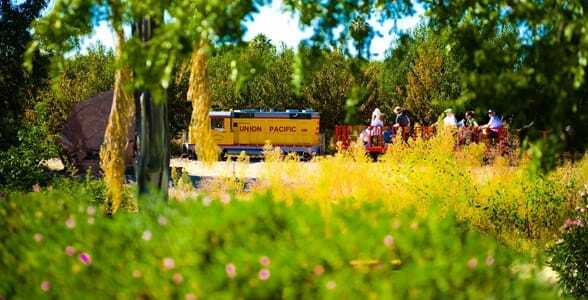 For a $3 admission, guests can go for a hay ride or train ride through orchards in full bloom. Its a romantic backdrop for any date — and you can split a peach pie or cinnamon roll at the Country Store and Bakery. The farm hosts weddings throughout the year as well. The Schnepf Farms’ motto is “We grow fun,” so visitors can always find something fun to do here. The Rockin’ R Ranch is a popular tourist destination known for its all-you-can-eat barbecue and family-friendly entertainment. You can take a trip to the Wild West with your date and enjoy a cowboy supper and show. The signature crumb cake is a sweet treat for sweethearts, and the staged gun fight will have you cheering and laughing together. Mesa is packed with distinctive sights and engaging date venues. You can stroll through artistic exhibits at the Mesa Arts Center or check out the West’s largest dinosaur exhibit at the Arizona Museum of Natural History. Wherever you go, you’ll have a great time absorbing the culture of this Western oasis. Mesa is a vibrant place to go on a date. You can spend an afternoon or a weekend getting away from the hustle and bustle of everyday life in a beautiful oasis in the Old West. The local flavors, friendly atmosphere, and scenic views will take your breath away as you tour the city and its surrounding area. The City Limitless offers countless activities to entertain couples throughout the year. From its mountain ridges to its downtown breweries, Mesa serves up unforgettable experiences for anyone with a sense of adventure.